Our accredited program is designed to meet your needs. Whether you are an international student who is preparing to enter an American college or university, a professional who wants effective business English communication skills, or someone who simply wishes to reach English fluency, you will receive a custom tailored program. With over 40 classes, you will be able to select courses that will meet your personal goals. GGLS has two full-time programs. •	COLLEGE TRACK lets you complete each English proficiency level in 4 weeks. You will study 6 hours per day (30 hours per week) and reach English fluency and admission to one of our affiliate colleges and universities in the shortest possible time. •	GENERAL TRACK allows you to complete your English studies at a less intensive pace. You will study full-time but only 4.5 hours per day (22.5 hours per week). Both programs allow you to study and practice English all day at the school – in the classroom, during social activities, at lunchtime and, of course, with your friends. If you are planning to attend a U.S. college or university after your English studies, you might consider entering the Conditional College Acceptance Program. At GGLS, you can prepare for the TOEFL Test or complete the TOEFL Waiver Guaranteed Transfer Program. A Sample Schedule for College Track is available in English. Having taught at a large university ESL program, I have found that the GGLS program helps students build the solid English foundation necessary for their college and professional success. By combining interesting subjects with a thorough and easy technique for learning grammatical structures as well as listening, speaking, reading and writing skills, students are well-prepared for their academic and professional futures. We recommend a schedule of 1-3 hours per day if you want to improve your English and also have time for other activities. 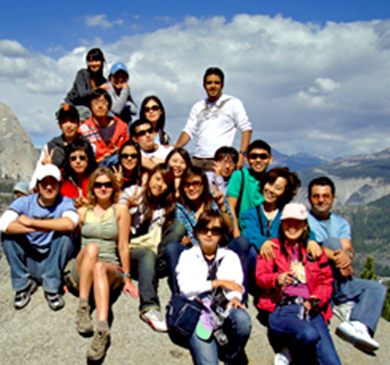 You can advance your English speaking and listening skills and then spend the rest of the day exploring California. Start classes at any time and study for any length of time. Just call a few days in advance to schedule a placement test and evaluation. If you would like to enhance your learning even more, we offer two programs that can be combined with your IEP classes. With Intensive English Tutoring, private lessons help you speak more fluently and make even faster improvements in your class. 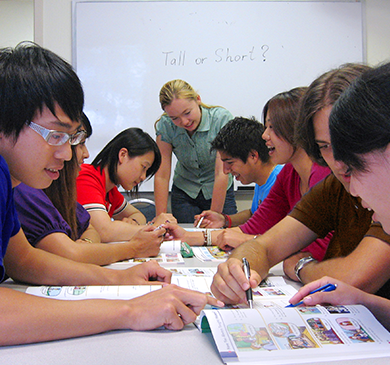 The Custom English Program gives you the opportunity to study specific language skills and areas of interest to you. Both options are available at convenient times. Before the start of your program, you will complete our placement test to determine which of our 12 levels are right for you. During your private consultation with the Director, she will help you select the classes that target your needs and goals. We recommend that you take the test 2 or 3 days before you register for classes. Tests are given by appointment only.